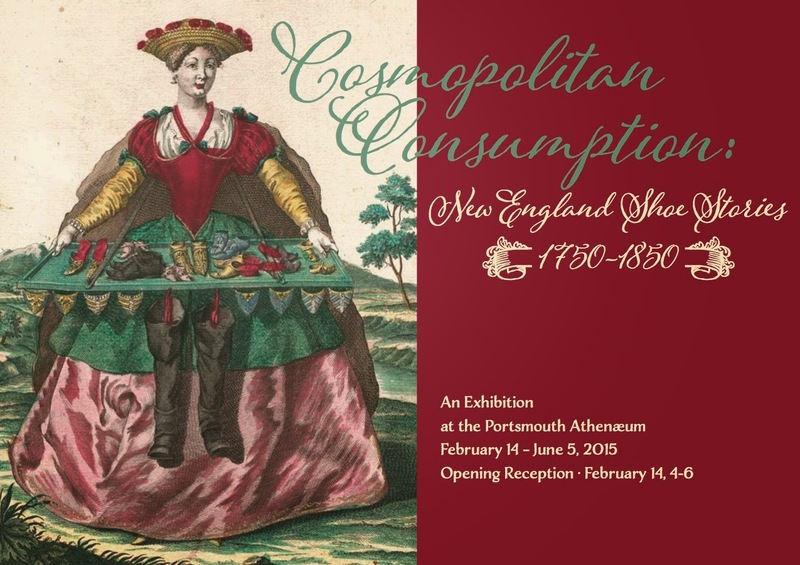 I greet you with excitement on this wintery morning: Presenting the invitation for "Cosmopolitan Consumption: New England Shoe Stories, 1750-1850," co-curated with Sandra Rux, curator emerita of the Portsmouth Historical Society and independent museum professional. We have selected over 35 pairs of historic shoes from over a dozen museums and private lenders. The exhibit will display wedding shoes, dancing slippers, boots, everyday and remade shoes, as well as some rare garments and accessories. Visitors will see dazzling brocades and damasks, silks, leather, and calamancoes—from New England, Great Britain, and France. Many of the pieces in the exhibition have never before been viewed by the public. Through the lives and letters of clever apprentices, skilled cordwainers, wealthy merchants and elegant brides, Cosmopolitan Consumption will take us on a journey from bustling London streets, to ship cargo holds, to New England shops and, ultimately, to the feet of eager consumers throughout the region. The “shoe stories” recount a young bride dancing with George Washington during his visit to Portsmouth or a pair of shoes remade from a 1730s wedding dress to a pair of 1773 wedding shoes. They trace the fortunes and misfortunes of wearers as shoes were altered to accommodate poor health and changing styles, and finally, they provide glimpse into the shoemaking business of artisans like Sam Lane of Stratham, who sold his shoes at Market Square in Portsmouth. This rich shoemaking heritage continues today. We ask our viewers to consider how these fashionable shoes reveal the hopes and dreams of New Englanders. 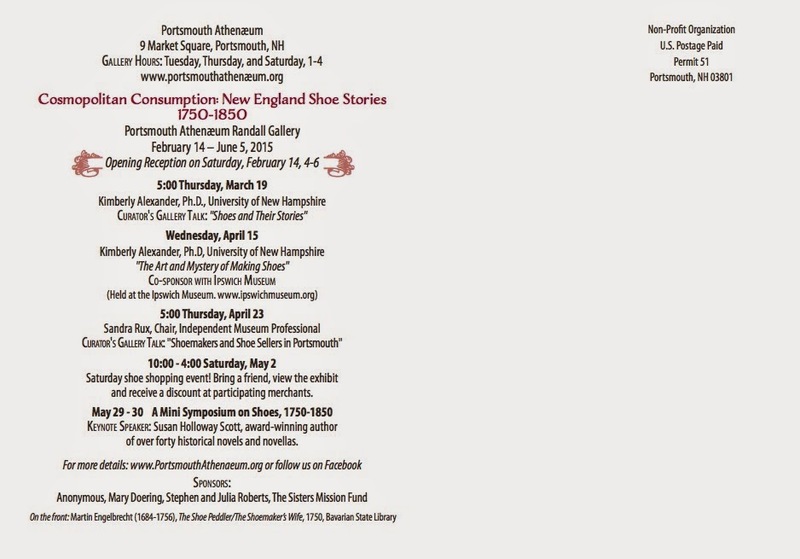 So, mark your calendars: February 14-June 5 2015 at the Portsmouth Athenaeum in Portsmouth, New Hampshire! We extend our appreciation to the many lenders and sponsors who have made this endeavor possible. Hard Times for a Shoe Seller.